As mentioned and illustrated in FutuREstorative, we will see an alignment in building sustainability and performance standards over coming months and years. In the US we have seen an alignment between LEED and the Living Building Challenge on materials (Red List) and recently on energy and water. On Monday 28th Nov, we saw an announcement from The International WELL Building Institute and BRE for an agreement to pursue alignment between WELL and BREEAM will making it easier for projects pursuing both standards. In practice this will mean documentation submitted for certain credits will be recognised by both WELL and BREEAM, saving project teams time and cost. This will be a very interesting journey and further recognises the importance of health within building design, construction and use. WELL, like the Living Building Challenge is an excellent, robust but tough standard and one that cannot be attained without a different mind-set approach to buildings. Key to that mindset is recognition of the impact of materials on health on construction workers and building users. An alignment or agreement between BREEAM and the LBC’s Red List would make great sense here. Health – the next performance gap. I will also be watching with interest if this agreement extends to the construction process, (ie. the BREEAM MAN credits) to improve the wellness and health of those involved in and affected by construction works. This is a health and wellness area that BREEAM, LEED, WELL and the Living Building Challenge do not readily address. Yet for those whose career is spent on construction sites, it is a key health and sustainability area, and one that benefits from biophilic design considerations, for example greenery in accommodation and living walls as project hoardings. This entry was posted in comment, Health, sustainability and tagged air quality, biophilia, biophilicdesign, BRE, BREEAM, construction, FutuREstorative, Health, International Well Building Institute, LEED, Living Building Challenge, living walls, Red List, sustainability, toxic materials, Well on November 30, 2016 by martin brown. Why did I seek to put Green BIM into Room 101 ? Did I not tweet only this week that Green BIM is one of the more important developments in the built environment? 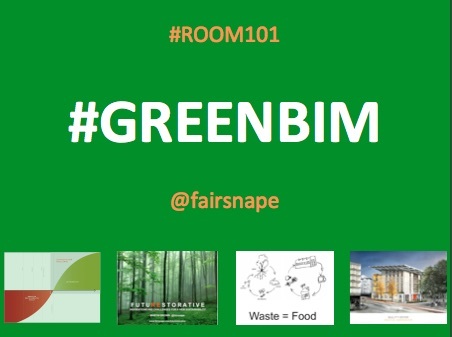 The label, or hashtag for GreenBIM is so riddled with issues, I was only able to skim during the 2 mins allowed in the ThinkBIM / Green Vision Room 101 session, and in fact is pre-occupying a lot of thought and space in my forthcoming RIBA book. However, in 5 bullet points … here goes. BIM (and digital construction) is the most powerful of improvement and collaborative programmes for decades, if not in the history of construction – all BIM should be green – all BIM should be pushing the boundaries and doing more good, not happy just to maintain a business as usual, a sustainability status quo or be incrementally less bad. Every BIM is a core enabler in achieving Construction Vision 2025 through sustainability and carbon targets – requiring net positive approaches. Construction 2025 is not just for GreenBIM’s. One of the fast emerging sectors within the world of sustainability, with a predicted market value in the billions, is the circular economy – every BIM, not just GreenBIM’s should be addressing this concept. In particular, where one building becomes the food, the material farm, for the next building. Am I in danger of creating a new hashtag and meme here: #CEBIM _ Circular Economy BIM anyone? Green Vision has embraced Living Building Challenge – where, for accredited projects like the Bullit Centre there are no energy performance gaps – this is what a BIM should achieve on every building, green or not, and fast. Lets seek a net-positive performance gap. This is Construction Vision 2025! Conclusion: My reason for putting GreenBIM into 101 is more out of frustration than annoyance. We would all agree that all BIM’s should be GreenBIMs, so do we need another label, perhaps, perhaps not, but what we do need to do is to take the agenda from ‘GreenBIM’ sessions to all other BIM events, initiates, software, projects, and make every BIM Green. I also blogged on this very issue back in 2013 – Do we really need ‘Green BIM’? This entry was posted in comment and tagged BIM, circular economy, FutuREstorative, GreenBIM, LEED, restorative sustainability, sustainability, thinkBIM on July 2, 2015 by martin brown. Not a good day for Green Building in the USA. I feel sad for friends, colleagues, advocates in the US who are passionate in defending real green building and real building product transparency that will restore the damage done by the built environment. Dream on. Green Globes is now recognized as legit and will eat your lunch; it’s cheaper, it lets builders use all that plastic, and doesn’t give points for FSC certified lumber. In state after state, the politicians paid for by the plastics industry will insist upon it. Unfortunately I see this as a discussion, then argument and battle waiting to happen here in the UK and Europe. As we push for deeper green standards such as the Living Building Challenge, for deeper product transparency, as Google and other clients will undoubtedly push for non toxic red list materials in their buildings, we will see the push from the power of the petro-chemical, plastics and big lumber organisations, resisting change for healthy products. The UK green build fraternity, advocates, green build councils and accreditation organisations needs to hold strong in the coming years. This entry was posted in comment and tagged BREEAM, green build, green building, Green Globes, Greenest Government Ever, greenwash, LEED, Living Building Challenge, Lloyd Alter, Red List, treehugger on October 29, 2013 by martin brown.